In closing this series I want to look at an aspect of our lives that isn’t often referenced. In a previous post I referred to the three functions of our soul as our mind, will, and emotions and connected them to the furniture in the tabernacle. “The inner court contained three objects, the lampstand which represents our mind (light and illumination), the table of showbread which represents our will, supposed to be broken (the ground grain) and submitted to His will, and the altar of incense, which represents our emotions and desires. The altar of incense was positioned right outside the Holy of Holies so the fragrant incense entered into the Holy of Holies, into His presence. Our desires are to be directed toward Him.” In another post I referenced the functioning of our spirits and noted, “We are called to an ongoing internal encounter with His glory within our spirits that is generally not observed by others, just as the ministry of the high priest before the Ark was not observed.” However, to walk this out we need to know how it functionally works so we can learn how to have and ongoing encounter deep within, to in practice carry the Ark. So how does this hidden aspect of our spirit work in practice? The theory is nice but what role does it play in our lives? Just as there were three visible object in the Holy Place that connect to aspects of our soul, there were three hidden objects in the Ark of the Covenant that connect to three aspects of our spirits. The Ark contained three objects, the tablets of the testimony (the Ten Commandments inscribed on stone) which relate to our conscience, a pot of Manna, which relates to communion, spiritual nourishment, and Aaron’s rod that had budded, which speaks of the intuitive life in our spirit. The scriptures are below. Relating these things back to our spirits, our spirit has the three main functions of conscience, communion and intuition. The scriptures illustrate these different aspects of our spirits. The tablets of stone, the commandments speak of the conscience aspect of our spirits. Paul addressed this in Romans. The manna speaks of ongoing spiritual nourishment, communion. Jesus and Paul both addressed this function. The rod speaks of intuition in our spirits. The rod was an apparently dead and dry stick but life was released through it when it was placed in Yahweh’s presence. There is life in our spirits through His regeneration and indwelling presence but we need to learn to pay attention to it. As we walk with Him and reflect back on the role of the Ark in the life of Israel, we have clues to how to pay attention to our spirits. As long as Israel moved with the moving of the Ark, analogous to being led by the Spirit (Rom. 8:14), they walked in victory. However when they neglected the Ark (Heb. 2:1-3) or moved in presumption, as when Eli’s sons took it into battle without Yahweh’s direction, they suffered loss. There is a phrase in Malachi 2:15 that is critical, the prophet says, “Therefore take heed to your spirit,” an injunction we would be wise to pay attention to; and need to learn to develop in much of the church if we are to fulfill our calling and purpose. In my next posts I will start a series on how we practically walk in the Spirit. So, having talked about what David did in setting up the Ark of the Covenant in Jerusalem, the worship that took place (most of our Psalms flowed from and were written in the context of this prophetic worship), and how David lived in a an aged of grace before it existed, what is the New Testament significance? Acts 15 was the first church conference and is known as the Jerusalem Council. The church was initially seen as a sect within first century Judaism and the followers known as those who were of the Way (remember Jesus is the way). I believe David’s behaviour also prophetically pointed to this way in that the Hebrews reference above refers to Jesus making a way into something through His shed blood, that something being the Holy of Holies, the home of the Ark of the Covenant, Yahweh’s dwelling place. How does this further tie together? The first Jerusalem Council in Acts 15 was a debate about the role of Gentiles in what was a predominantly Jewish church, as noted above. The issue was essentially whether the Gentile converts needed to practice Judaism to truly be saved. The conclusion was that they did not and the matter was essentially closed when Jesus half-brother James, the lead apostle in Jerusalem at this point, stood up and quoted the prophet Amos from the Old Testament. At first glance we might wonder what on earth this has to do with the subject at hand. Have you ever had the experience where on the surface something didn’t make sense and then suddenly the light came on? Years ago in some writing I defined discernment as ‘seeing the reality that lies behind appearances.’ This is what happened here. Through the spirit of revelation James suddenly saw and shared what he saw. He knew the Old Testament and recognized that David lived before his time and there was free worship before the Ark of the Covenant. James realized that the Holy Spirit falling on Gentiles, baptizing them into the body of Christ and imparting spiritual gifts was a fulfillment of what David did. The Gentiles did not have to follow numerous rules and regulations to encounter His presence, the Holy of Holies. Access was open and free. Just as David left the sacrifices, rules and regulations functioning at the Tabernacle of Moses at Gibeon and promoted open and free worship in Jerusalem before the Ark. This worship that released the anointing of the Holy Spirit on the worshippers before the Ark, just as was now happening in the New Testament church. So let us embrace and pursue Him as we learn to live out of His presence. Not performing rituals so we can encounter Him but rather embracing the truth of His word. The Tabernacle of David has been restored; we have open access and can live everyday out from His presence! 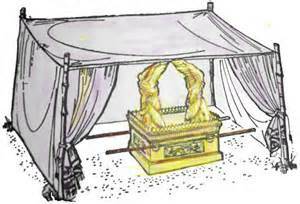 So David now has the Ark of the Covenant in a tent at Jerusalem? Why is this important and what happened next? David made a radical decision to follow his heart. We know from what Yahweh taught through Moses that the priesthood was Levitical and everlasting. In referring to Aaron’s sons this is what Yahweh said. The priesthood came through Levi, Moses and Aaron were both in this lineage, and what is described above was still happening when Jesus was born. Zechariah, the father of John the Baptist, as a descendant of Levi was ministering before Yahweh in the temple when the angel appeared to him and announced the birth of John the Baptist. The exception to all of this was during the reign of David in Jerusalem, a 33 year period, the same number of years Jesus walked the earth. The subsequent transition following David’s exception, which is the subject of the book of Hebrews, is when Jesus as the new high priest forever replaced the Levitical priesthood. Though he was not a priest David established open worship before the Ark in a tent. The picture below is a good illustration of what David established. The only way for David to have open worship before the Ark was live for 33 years in another age, the age of grace. He and others had no authority to minister before the Ark. So what did David establish? What is lost in the NKJV and most others is that the Hebrew refers not to a tabernacle or dwelling place. It is plural, as seen in the NASB. So while both places, Gibeon and Jerusalem, were described as lovely and as the dwelling places of Yahweh, the animal sacrifices happened at Gibeon and the passionate worship in Jerusalem before the Ark. What most of us may not be aware of is the fruit of the worship before the Ark at Jerusalem. This is where most of our Psalms came from and why so many of them were prophetic, they were delivered/written in the context of anointed worship! This is what we are called to, to come deeply into His presence, encounter Him and release His words. We continue our journey with the Ark by looking at what happened to the Ark of the Covenant when David became king. Bear in mind that the Ark represented Yahweh dwelling among His people. At first glance one could say David found the Ark and restored the Ark to its rightful place in Israel. He brought if from obscurity to his new capital city Jerusalem. Yet David not restore the Ark, he did something radical. We know that the Ark was designed to dwell in the Holy of Holies inside the Tabernacle of Moses (Ex. 40:34-38). In fact when the Tabernacle of Moses was assembled for the first time His glory came and for the rest of the journey in the wilderness the movements of the nation were governed by the movement of His glory! This was an amazing place and time, yet David discovered something deeper. Have you ever felt driven to do something and felt you could not rest until it was accomplished? David had a deep insatiable longing in his heart. He was hungry for the Ark, for Yahweh’s presence. Yet David had some challenges in satisfying this internal longing. 2 Samuel 6 describes what happened. First they tried to bring the Ark up on an ox cart and Uzzah died. Uzzah had grown up with the Ark as it had been in his father’s house for at least twenty years and he and his brother were driving the ox cart. Yet he did not seem to grasp the significance of Yahweh’s presence and when he touched the Ark he died. David presumptuously thought that if they worshipped while they traveled with it Yahweh would be pleased, He was not! These were His covenant people and Moses had taught them how to worship Him and hallow His name yet this was not being done. After his aborted attempt to bring up the Ark David was both angry at Yahweh and afraid (2 Sam. 6:8-9). It would be good to pause and reflect on how we view His glory. David took time to pause and reflect. He left the Ark in Obed-Edom’s house for three months while he decided what to do. David still had his hunger for Yahweh’s presence so he prepared a tent for the Ark to dwell in and then looked at how to transport the Ark (the tent will become important later). He realized the problem lay with him and instructed the Levites to carry it as instructed by Moses. David again incorporated worship and also included sacrifices. What is instructive in this passage is the meaning of the seven bulls and seven rams. As a number in scripture seven usually represents completeness, for example seven days complete a week. The other significance is the bulls were a sin offering and the rams a trespass offering (see Lev. Chapters 4-5). David realized he had sinned and trespassed against Yahweh in his presumption and enthusiasm. The next step in the process is very important. Many believe Psalm 24 was sung when David brought the Ark into Jerusalem. It is below in its entirety. What do our lives declare about our devotion to His Lordship?